Sonia Boyce came to prominence in the 1980s as one of the leading artists of the British Black Arts Movement. She is the recipient of numerous accolades including an MBE for services to the arts in 2007 and a recent Paul Hamlyn Award. Last year, she was elected as a Royal Academician. 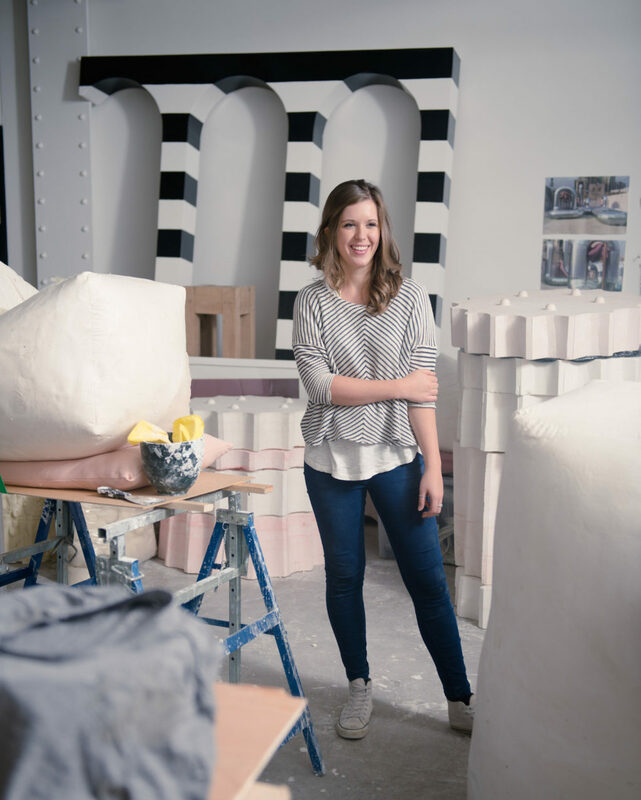 Boyce’s work has been shown extensively across the UK and internationally including at the 56th Venice Biennale and the Whitney Museum of Modern Art (both 2015). 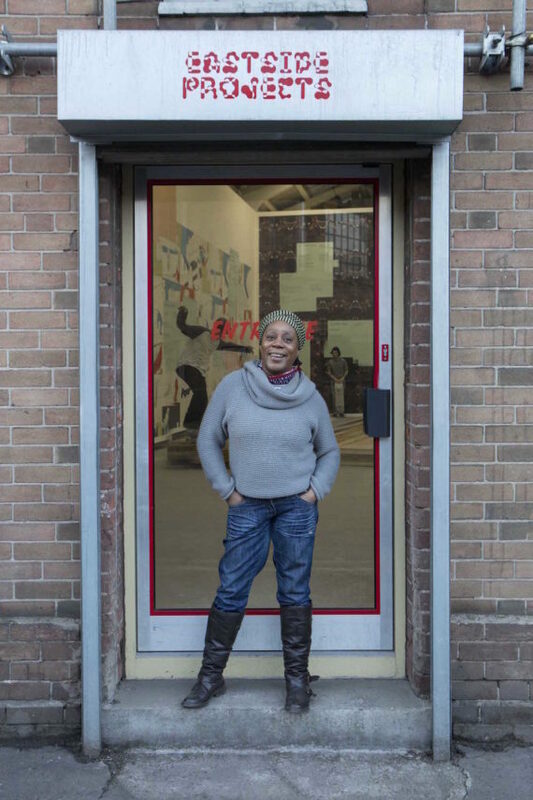 She is currently leading on a three-year AHRC-funded research project, Black Artists and Modernism, and is Professor of Fine Arts at Middlesex University. 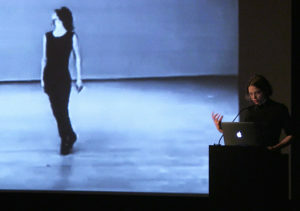 Since 1990, Boyce has been exploring improvised performance through a variety of collaborative projects with artists. This approach feeds into her interests in art as social practice and is manifest through a wide variety of media. Alongside her current solo exhibition at ICA, ‘We move in her way’, she is part of the latest iteration of ‘Production Show’, subtitled ‘Building/Developing/Testing’, at Eastside Projects, displaying two new large-scale pieces she describes as ‘wallpapers’ and an unfolding performance with skateboarders. 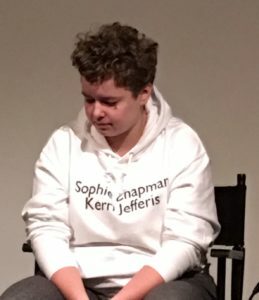 For Wallpaper/Performance (2017), the exhibition at Eastside Projects has been shuffled around and the gallery has been segmented into performance and audience space. 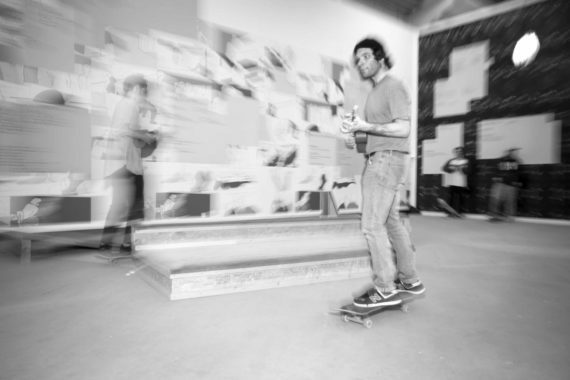 Some of the skateboarders glide the width of the gallery playing ukuleles; others jump specially-designed ramps and obstacles and aggressively clatter against the gallery walls. How did you arrive at the somewhat unlikely subject of skateboarding ukulele players? I know nothing about skateboarding; I know a smidgeon more about ukulele playing. I’ve been thinking about how to extend play, working with people and with improvisation, and thinking about how, where, when and who can play. Play is a very circumscribed thing, particularly for adults. When I visited Eastside Projects for the first time I had been thinking about skipping. I tried to find a manufacturer of skipping ropes in Birmingham and couldn’t find one. 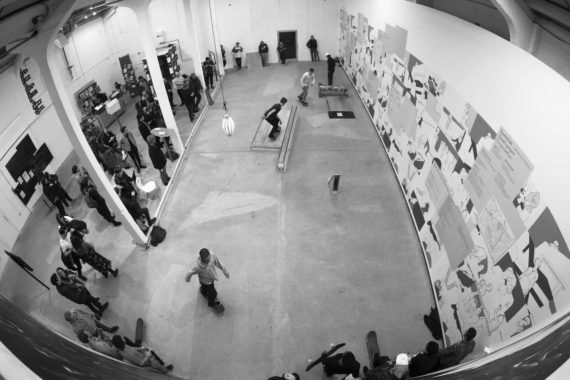 But just around the corner from the gallery is A Third Foot, the only remaining UK skateboard manufacturer. They had previously asked Eastside Projects if they would be interested in ukulele playing skateboarders and I just thought, we’ve got to do that! It’s nothing I would ever have put together. Even just saying it makes you smile. The group that play and skateboard was started by Jorge Gomez Abrante, a jobbing musician who gave up driving and travelled everywhere by skateboard, tuning up and practicing before a gig. 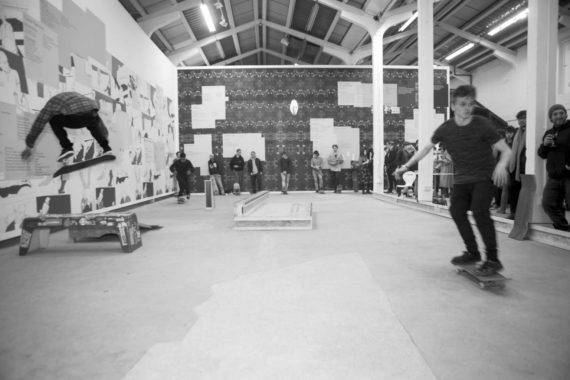 The composition these skateboarders are working with is a series of instructions for each player that make a score. It’s improvised but these are the starting points. Different bits are being followed. There is a literal barrier between audience and performer. Could you tell me about the staging of Wallpaper/Performance? My concern (and I’m still concerned as we speak) is that there are objects and people in the gallery. Skateboarding in itself suggests you can fall off, that the skateboard can escape. There is a real danger of injury. The skateboarders have reached a point where they can manage their anxiety about this – but an audience? Audience participation is limited in this way. I’ve been watching for about half an hour and my stomach is in complete knots. It’s been interesting to see the differences between those skateboarders jumping objects and the balletic quality of those who are gliding along playing the ukulele. There is something really melancholic and sweet about the ukulele which cuts right against the aggression which is palpable and really audible. What are you planning for the second performance in April? We will be travelling from the outside into the gallery. I’m working with a photographer, sound recorder and cinematographer and we’re thinking about logistics. I’ll make another wallpaper design that will go up in the gallery, probably over the existing pieces. This is how things work at Eastside Projects – certain things come in and out and build up over time. It’s how I work, too – out of processes, various layers come together. I will also make a design for a skateboard and 50 will be produced. Some will be given to skateboarders in the next performance and others will be for sale. The next performance is to be filmed – it may have a different atmosphere and include other things. Tell me about ‘We move in her way’ at ICA. 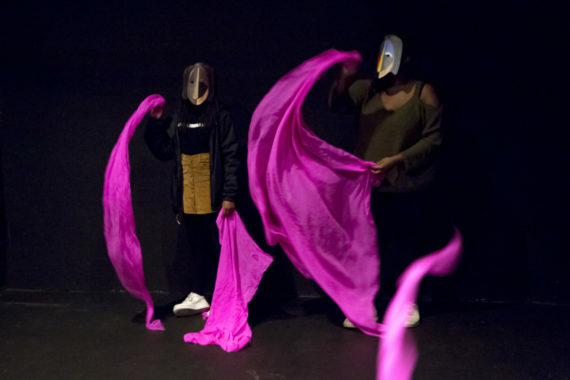 For the theatre space, I worked with vocalist Elaine Mitchener and dancer turned visual artist Barbara Gamper who makes sculptures as performance objects. 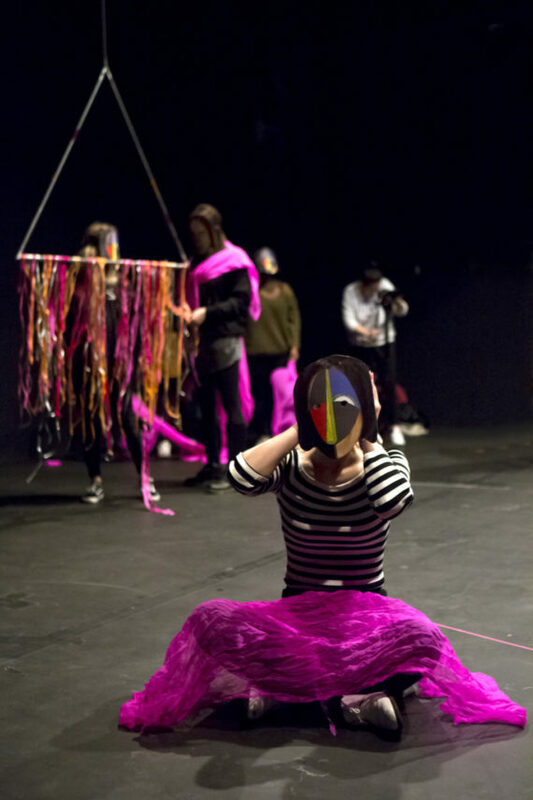 Barbara invited three dancers to perform these sculptures – geometric structures with jangly bits, cloth and ribbons – and we sent out a call for people who might be interested to participate in the performance that would emerge. I made masks for the audience but there was no script. After a time, audience members slowly moved into the centre of the space, away from its dark corners, and they played with the materials. After Elaine, Barbara, the dancers and the film crew packed up and left, the audience was still playing. What became clear was that there was a real desire to get involved in play. It really was like watching kids in a playground. One of the wallpapers at Eastside is taken from the ICA performance. Can you tell me about the other? I worked with art students at the Villa Arson in Nice, dancer-choreographer Vânia Gala and a grunge rapper called Astronautalis. The building is a beautiful brutalist structure bolted on to the side of the Villa and I wanted the students to work with performance in an improvised way. I produced drawings from one of the nine videos of these improvised performances to make a wallpaper. Its modernist colour scheme references that architecture. The ICA one uses mirroring to build a pattern. Why are they wallpapers as opposed to billboards or simply prints? There is a domestic quality implied and other works in ‘Production Show’ have this quality – Nicolas Deshayes’ heated radiator sculptures, for instance. I’ve been interested for a long time about wallpapers as strident images or as things that disappear into the background. Wallpaper makes a space immersive in a way which might not be immediately obvious. What’s been interesting here is how they work with everything else in ‘Production Show’. These things are distinct but part of something else – an analogy between how difference can situate itself. It’s seen as rebellious – an update of the rebel without a cause generation. This form is a vehicle for striking out for a group identity and for reclaiming and reusing urban space. Collective and individual agency is really important in relation to space. Yes, and the gallery space. There is a tension here between which is more valuable – the objects, the space or the people in it? You really get a sense of the space being battered. It’s quite interesting to study the skateboarders, which might sound a bit perverse but I hope they’re getting something out of this rather than it being a one-way viewing. There are all sorts of things that are pushing my buttons about value and the gallery being a proto-church while at this moment there are people literally bouncing off the walls. But the building and its objects have to survive this process too.